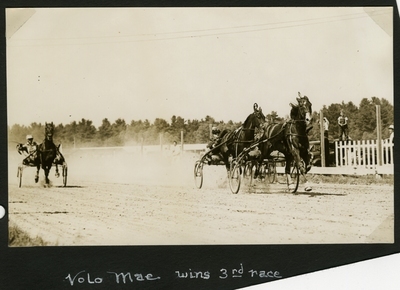 Sepia tone action photo of bay mare, Volo Mae wearing head number four (far right), Muckle up, for the first heat of the Free for All Trot, Monday, July 3, 1939, Gorham Fair, Narragansett Park, Gorham, Maine. Finishing in second place was bay gelding, Lu Barrient, wearing head number two, Carney up. Showing in third place was bay gelding Isola's McElwyn, Phalen up.